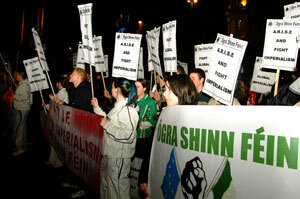 ONE of the big stories of 2007 was the growth and development of Ógra Shinn Féin right across the island. Ógra Shinn Féin, through its campaigning activism, brought a new dynamic to the republican cause. One of the biggest areas of growth for Ógra was within Cúige Laighean. In the past 18 months, Ógra Shinn Féin Cúige Laighean has grown from an area of sporadic activities to one of the most energetic Ógra cúigí in the country. Over the following months, the two Cúige Laighean cumainn in Dundalk and Kilkenny worked constantly to strengthen the Ógra structures in their areas, keeping in mind the three key functions of Ógra: campaign, recruit and educate. This work paid off that summer when Ógra in Kilkenny held their first ‘Republican Youth Weekend’ in the Marble City. The Republican Youth Weekend was a roaring success. Young Ógra activists from across the country descended on Kilkenny to give their support to the ambitious endeavour. Republicans from Cork to Antrim, and everywhere in between arrived in Kilkenny for a weekend of discussions and debates as well as the first republican march in the city for 25 years. The weekend coincided with the 25th anniversary of the 1981 Hunger Strikes. Councillor Paul Butler (now an MLA) arrived in Kilkenny to speak to the young activists about that time, as well as sharing some of his own personal experiences from then. 2006 also marked the 70th anniversary of the Spanish Civil War, a discussion around which was facilitated by Dan Connolly. When the weekend came to a close on Sunday, there was little doubt that Ógra would be back in Kilkenny the following year. Ógra Laighean was now developing at a fast pace. Since an Comhdháil Náisiúnta in February a new Ógra cumann in Meath had been established and Leinster had hosted its first Ógra weekend. Enthusiasm was at its peak with the freshers’ fayres fast approaching. In August, a number of Ógra activists from the Six Counties went on a road trip around the country to promote the specially-commissioned Ógra Shinn Féin book on the Hunger Strikes, Awaiting the Lark. The tour, which began in Belfast, visited Cúige Laighean on two occasions. In Dundalk, the new book attracted a substantial amount of interest in the local area and served as a catalyst for the local area, which mobilised a considerable number of people for the launch. After a visit to Dublin, the road trip then made its way to Kilkenny, where there was a large turn-out for the vigil and book launch. Shortly after this, the freshers’ fayres began in earnest. Leinster Ógra’s hopes were high going into the campaign with representation in all but one third-level institution, Carlow IT. Kilkenny Ógra were tasked with establishing a new cumann in the college. This endeavour was a success and as An Comhdháil Náisiúnta approached, Ógra Laighean was growing at a blistering pace. An Comhdháil Náisiúnta in Liberty Hall in Dublin in November, saw the launch of the new national campaign, ‘ARISE’. This campaign acted as a springboard for Ógra activity across the country, not least in Leinster. Activities took place each month across the cúige, bringing more young people into Ógra. Not only did this campaign give Ógra a chance to be seen more in their local areas it also gave them the chance to bring their republican politics to the streets, engaging and connecting with people on the ground. Before the general election in May there had been some discussion surrounding the possible division of the Sinn Féin structures in Leinster. After May this became a reality, and areas were made aware that the Cúige would divide in two parts by the end of the year. Not being a group to shy away from a job of work, Ógra Cúige Laighean took a decision to immediately appoint two activists to better co-ordinate Ógra’s development in each of the two cúigí. While the progress of Ógra Laighean had been phenomenal up to that time, the presence of these activists tasked with developing each end of the cúige, should further aid the growth of Ógra within the cúige. Indeed, the fruits of this endeavour can already be seen in the new South Leinster Cúige where there are now active Ógra members in four of the five counties, in comparison to 18 months before when there was only a handful of members across the entire cúige.